Like the rest of the world, I have been on a cauliflower kick lately: cauliflower pizza, mashed cauliflower, cauliflower fritters. My kids aren’t totally sold, but they are slowly coming around to it. 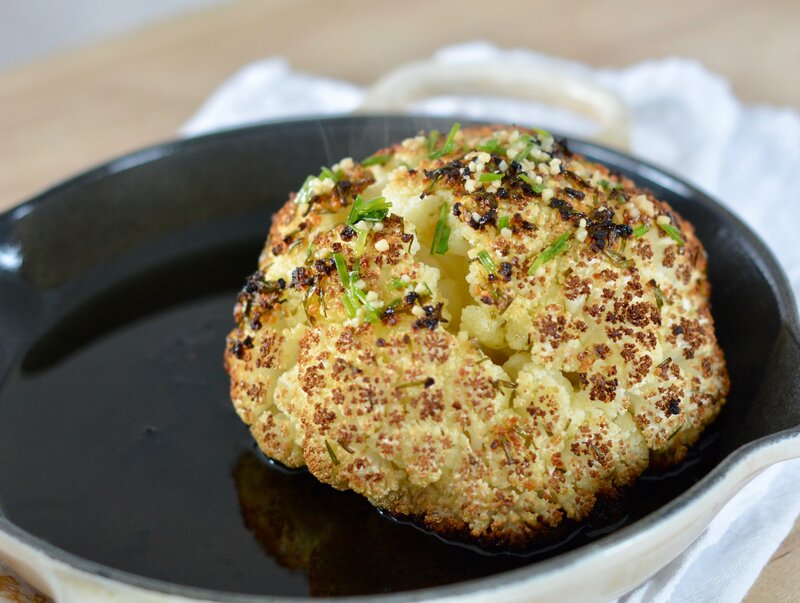 Fortunately, this whole roasted cauliflower recipe is so delicious and easy to make that it can turn any cauliflower-hater into a fan. It’s crispy on the outside and tender on the inside. It’s just a whole head of deliciousness. 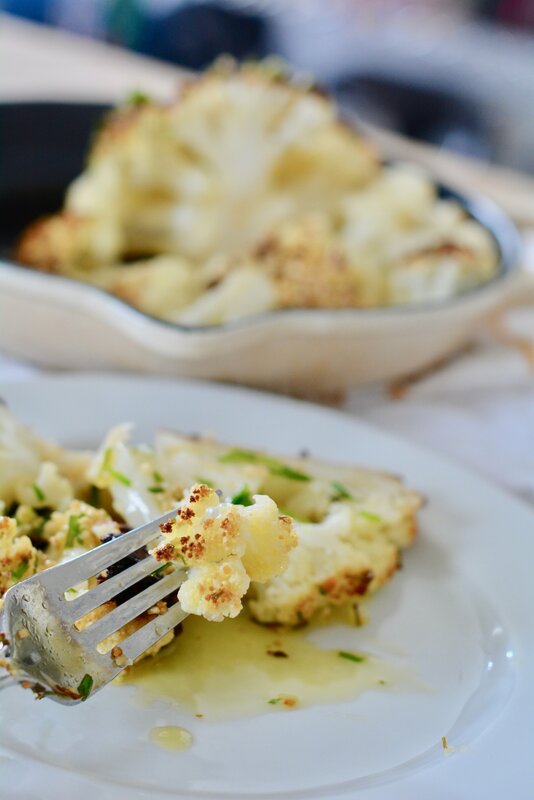 I’m trying to incorporate more plant-based meals into our repertoire, and it’s big wins like this amazing roasted cauliflower recipe that make it a cinch to convert the whole family. 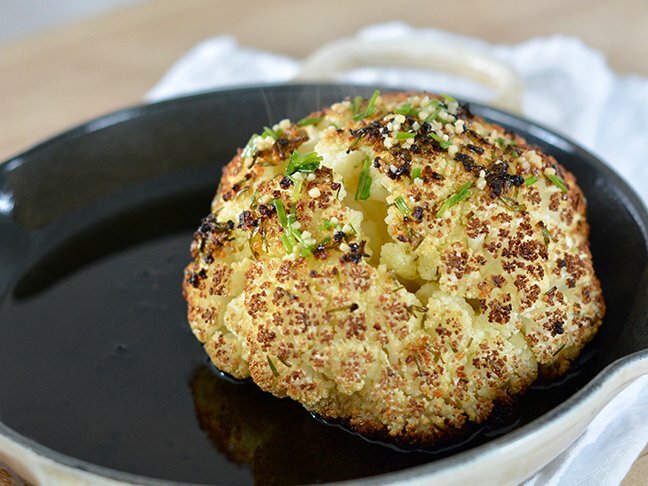 Want to have a go at whole roasted cauliflower? This recipe is incredibly simple, and once you master the method, you can keep things interesting by doctoring it up with the spices and flavorings of your choice. Step 1: Preheat the oven to 425 degrees F.
Step 2: In a small bowl mix the chives, garlic, olive oil, lemon juice, pepper, and salt. Then, divide the mixture into two bowls. Set one bowl aside to use as a sauce for serving. Step 3: Trim the cauliflower head by cutting the stem and any leaves off the bottom so it can sit upright in an oven-safe dish or skillet. Step 4: Rub half of the olive oil mixture all over the cauliflower head so that it is evenly coated. Don't worry if it absorbs the olive oil. Lightly rub the bottom of the stem so that it doesn’t stick to the pan while it cooks. Step 5: Roast the cauliflower until a fork can easily spear it, for about 55 minutes to 1 hour. If the top of the cauliflower starts to get too brown, tent it with aluminum foil. Step 6: Remove the cauliflower and allow it to cool for 10 minutes. Then, slice it into large pieces and serve with a drizzle of the remaining flavored olive oil.